Some known abusers were moved to parishes "with direct access to children," according to the new report. A law firm that represents clerical sexual abuse victims released a massive list Wednesday of Roman Catholic priests in Illinois, along with six nuns and a handful of lay people, who have been credibly accused of molesting children. Some of the accusations in the 185-page Anderson Report on Child Sexual Abuse in the Archdiocese and Dioceses in Illinois stretch back more than half a century. The 395 names listed are nearly double the number that church officials in the state had previously released. But only one of the priests in the report, Father Michael O’Connell in Chicago, continues to tend to a flock, attorney Jeff Anderson said at a press conference in that city where the report was unveiled. The rest are either dead or no longer in the ministry. Yesko first came forward with allegations in 2006 against two priests from the Diocese of Springfield who are named in the report, Father Louis Schlangen and Father Stanislaus Yunker. Both are now deceased. Anderson’s report was unveiled four months after Illinois Attorney General Lisa Madigan revealed that officials have received allegations of sexual abuse against nearly 700 priests and clergy members in the state. Those complaints are now under investigation. The Archdiocese of Chicago and the dioceses of Belleville, Joliet, Peoria, Rockford and Springfield orchestrated “an institutional coverup of enormous magnitude,” Anderson said. Even with 395 names in the report, it’s an undercount, the report says. 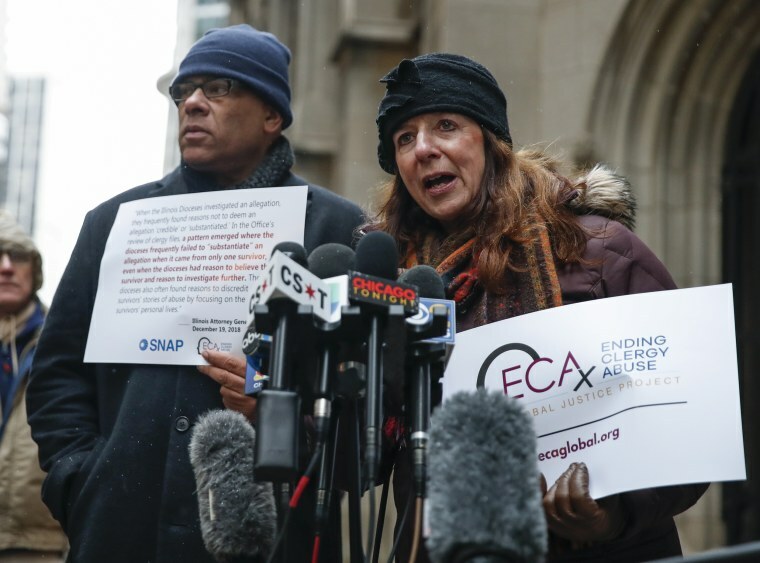 “It is believed that the Dioceses in Illinois have not publicly made available the full histories and their knowledge of their sexually abusive agents and employees,” the report states. Several of the names in the Anderson report had been released earlier by the Jesuits, including the names of several priests who taught at St. Ignatius College Prep, an elite Catholic high school in Chicago — Father Allan Kirk, Father James Condon, Father Stanley Wisniewski and Father Bernard Knoth. Kirk, Condon and Wisniewski are dead. Knoth is living in Florida and declined to be interviewed. Asked specifically about the status of Father O’Connell, spokesman Alejandro Castillo said both allegations against him “were reported and were judged by civil authorities and the archdiocese to be unsubstantiated.” He remains a parish priest. The Diocese of Rockford said in its statement that only one of the 22 priests named by Anderson, Ivan Rovira, had not previously been divulged. It said Rovira was a parish priest in the diocese for just two years. “The Rockford Diocese has never received an allegation against Ivan Rovira, and was unaware he was accused in another Diocese until the list was issued today,” it said. Rovira’s last posting was in Texas and his current whereabouts are unknown, according to the Anderson report. “Each of those claims was forwarded to the civil authorities for investigations and potential prosecution,” the Joliet diocese statement read. The Diocese of Springfield said as far as they are concerned, Anderson's report is out of date. "The majority of instances of abuse occurred more than 30 years ago, and only one instance has occurred in the past 20 years," it said in a statement. The Diocese of Peoria said in a statement most of the 29 diocesan priests named in the report are dead. It said one of the priests, Father Frank Martinez, was never accused of anything and is now a parish priest in Davenport, Iowa. It said another, Monsignor Charles Beebe, was cleared after an investigation by the Peoria Police Department. He retired in 2016. There was no immediate response from the Diocese of Belleville. Six nuns are named in the report. Sister Norma Giannini is dead. So is Sister Benen Kent. And Sister Agnes Santomassimo is also believed to be dead. The whereabouts of the remaining nuns, Sister Mary Jane, Sister Cheryl Porte and Sister Josephine Schmitz, were not known, according to the Anderson report. A longtime advocate for clergy abuse survivors, Anderson’s team released a report on the Archdiocese of New York in February which also included two nuns on its list of more than 100 priests and other clergy staff accused of sexually abusing children. Anderson’s team also released a similar report two years ago in which 263 priests in three San Francisco Bay dioceses were branded accused sexual predators. Just as in Illinois and New York, the names were culled from publicly available documents, including legal settlements and news accounts. Most of the Illinois priests were never charged with crimes. Asked if he had any qualms about making their names public, Anderson said no.